New York - Preparations for the 12th All-Diaspora Orthodox Youth Conference, sponsored by the Fund for Assistance ($50,000) are heading into the home stretch, scheduled to be held in Paris from July 1-8, 2011. Registration of the young missionaries has closed, and there will be some 150 participants, of them 120 Orthodox youth from 23 dioceses in Russia and abroad, and five hierarchs from Russia, the US, France and Switzerland. Protopriest Andrei Sommer, Vice President of the Synodal Youth Department of the Synod of Bishops of the Russian Orthodox Church Outside of Russia, spoke on this topic. - Fr Andrei, are the agenda and plan for the Conference being announced? - The program for this youth forum includes both theoretical and practical work, round tables, seminars, and also divine services and interesting pilgrimages, cultural events and socializing among the youth and guests. - What practical skills will the young missionaries gain from this forum? - First of all, I’d like to note that the goal of this huge event, preparations for which have been going on for almost a year, is to develop interest towards missionary practice and to help young people recognize the important role that proselytizing activity plays in the spiritual lives of people and the life of the Church. Speaking before the youth will be such renowned pastors and theologians as Protopriest Boris Henderson; Oxford University graduate Hieromonk Irinei (Stinberg); Protopriest Serafim Gan; Protodeacon Alexander Ageikin of Moscow, and Protodeacon Konstantin Semovskikh of Australia. Also reading lectures will be representatives of the Western European Exarchate. Round-table discussions will be headed by His Grace Bishop Theodosius of Seattle and His Grace Bishop Ignaty of Bronnitsa. -During the conference, the participants will be broken up into 15 groups of ten each. Every morning will begin with working sessions, after which the kids and their spiritual fathers will separate into these sections. Theoretical and practical projects will be developed by each group for their diocese or parish as models of missionary work. This might be things like setting up a soup kitchen, an Orthodox cafe, launching an Orthodox website, magazine, television or radio program, an Orthodox choir for divine services or concerts, educational programs for parish schools, Orthodox summer camps, setting up senior centers or medical clinics with chapels. Each group will then be given 10 minutes to present their missionary project. This way, all the participants will come home with a package of proposals they can act upon. - Will these projects be submitted to a jury? - Yes, these projects will be prepared as part of a competition, which will be presented to a commission of clergymen, serving as a council of directors or sponsors for confirming or supporting these projects. That is, we are setting as a goal that these tools learned at the conference be taken home to each diocese and parish and brought to life. The goal of the conference is to teach young people not only to discuss but to act upon Orthodox mission, to bring living witness of Christ, to sense their own responsibilities and strive towards achieving goals. - I’d like to note that with the blessing of His Eminence Metropolitan Hilarion of Eastern America and New York, the First Hierarch of the Russian Orthodox Church Outside of Russia, the main holy icon of the Russian diaspora, the miracle-working Kursk-Root Icon of the Mother of God, will accompany us to Paris from New York. This youth conference will be held under its aegis. The conferees and guests will not only attend divine services but are also preparing to participate in them. On the eve of the feast day of St John of Shanghai and San Francisco, July 1st, vespers will be served at the hotel, headed by Vladyka Theodosius. The next morning, the feast day of St John, we will make a pilgrimage to Meudon, on the outskirts of Paris. A hierarchal Divine Liturgy will be celebrated at Holy Resurrection Church, where St John used to serve. 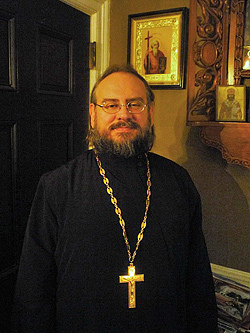 That evening, upon our return to Paris, His Grace Bishop Nestor of Korsun will officiate at all-night vigil at the reestablished seminary of the Moscow Patriarchate. On July 3, Sunday Liturgy will be celebrated at the renowned St Alexander Nevsky Cathedral on rue Daru, at which five hierarchs will serve. They will be joined by the conference’s clergymen, while the youth will participate as acolytes and sing in the choir. Every day, after the meetings and services, pilgrimages will be made to Orthodox holy sites of France, as well as excursions throughout Paris and its outskirts. The conferees and guests will venerate the Crown of Thorns at Notre Dame Cathedral, and on the feast day of St John the Baptist, the holy skull of the saint; they will visit the Louvre and Musee d’Orsay, the Eiffel Tower, the Champs Elysee, Montmartre, the Sacre Coeur, Versaille, and the Russian Orthodox Cemetery at Ste-Genevieve-du-Bois. - What will the cultural program include? - Experienced choir directors will hold rehearsals in the evenings to prepare for church and for a concert. The gala and concert that will close the event will include a performance by a combined choir of youth from Russia and the countries of the CIS, and from the countries of the “distant diaspora”—some sixty singers in all—and will be held at the Russian Embassy in Paris. Singers from the French ensemble “Volga” will also participate. In conclusion I would like to express my hope that the 12th All-Diaspora Youth Conference will act as a rehearsal for a larger All-Russian youth conference in Moscow, in which the clergymen and youth of the One Russian Orthodox Church will participate. Saying "Thank you" does not convey what we feel in our hearts..."
What if There were No Jordanville?